I don’t have this bike anymore. I wasn’t riding it at all after buying the Norco Magnum GT so I donated it to Bikeworks. Another volunteer snapped it up right away. 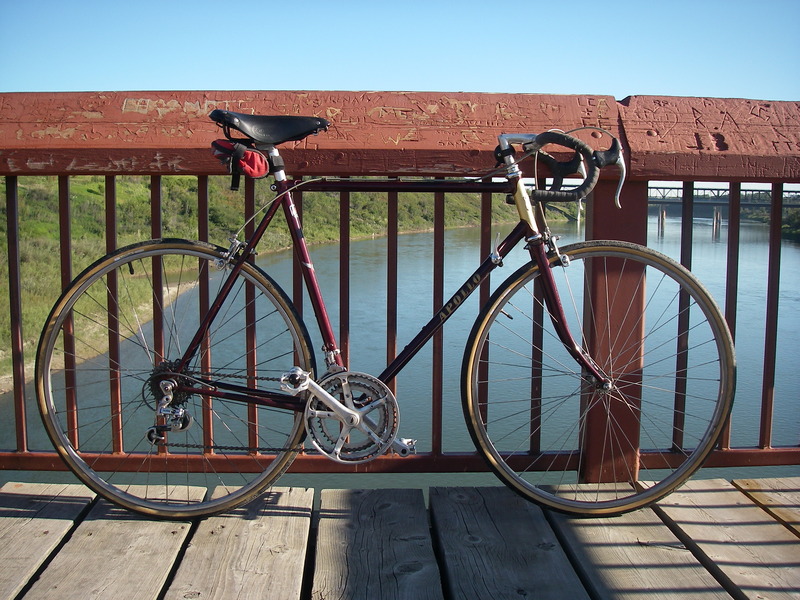 I purchased this bike via a Kijji ad for $50.00. If I’m interpreting the serial number correctly it’s an ’85 bike. The decals show that it was made by Kuwahara. I’m guessing it was just above the entry level Apollo’s but I could be wrong. The paint is in great condition aside from a few rust spots, the decals are mostly intact and it was in tuned up shape for riding. What a deal! I replaced the racing saddle with a Wright’s W3N leather saddle and replaced the clipless pedals with some old road pedals I had kicking around. This bike is fast, solid and has become my daily commuter in the couple of weeks I’ve had it. I’ve found the rear derailleur a bit finicky when shifting but I don’t have enough experience with older bikes to know if this is typical. Suntour AR derailleurs usually shift really well. Pardon me. Just found your blog off of Adrians blog. Have you followed Sheldon Brown’s procedure for derailleur adjustment? My guess is there’s friction in the cable housing somewhere it all is adjusted well. I think I own this bike now. I bought it in Edmonton in Summer 2012. You’ll know it is in great hands I ride it every day.